Quick! Baby’s Sleeping! Bake Bread! Homemade bread. Who can think about it without drooling a little? I wish we lived in a society that baked fresh bread every day, or at least bought fresh bread every day, and/or could afford to buy fresh bread every day. Bread made by hand makes me think of homey things. Grandma’s raspberry jam and real butter. Aprons. Yummy smells. 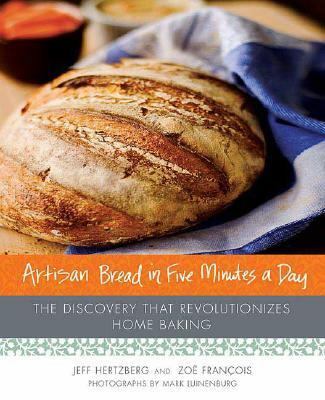 So when my aunt told me about the book Artisan Bread In Five Minutes A Day a few years ago, I was intrigued. My mom gave it to me for Christmas this year, with the understanding she’d get to borrow it, of course. I’m not sure where the “five minutes” part comes in, because no part of the process takes five minutes, but the general premise is true: Anyone can bake a simple loaf of bread, without kneading, without getting super picky about the steps. Their “master recipe” is a “boule” (ball) of French-style bread. You make it in batches of dough so that the second and third time around, you just pull the dough out of the fridge, let it sit 40 minutes, and dump it in the oven. And this is GOOD bread. The second loaf I made I brought to my mom. She exclaimed that it was the best bread she’d had since Vegas (where she had some really good food). You have to understand here that my mom is a good cook who can bake real bread, and I am an impatient person who is not super-careful with measurements and improvises too much. Since Christmas, the “boules” have become a treat at suppers in my house and in hers, and my sister has tried it, too. She said that she even skipped the initial resting phase her first time to get the bread done in time for supper. The loaf looked a little different but tasted just fine. I’m getting off track, but the point of this post is that baking bread does not have to be hard, as this book shows. Someone’s put the master recipe from the book I’m speaking of up here (http://andreainthekitchen.wordpress.com/2008/05/20/artisan-bread-in-five-minutes-a-day-master-recipe/), but I’d recommend buying or checking the book out to get the really interesting back story on the authors’ method. It’s fulfilling both spiritually and gastronomically. Great post – baking bread really is simple. You might like my recent post on fougasse! This recipe (artisan bread in 5 mins) is amazing. I have tried around a 100 recipes already, but this is my all time favourite!